Heroes, knights, seducers, hellish landscapes and infernal travelers, folk and fairy tales, Roman festivals, metamorphic humanoids, heavenly creatures; these are some of the ingredients of Gina Litherland’s pictorial wonder worlds. This solo exhibition in Chicago in the Spring of 2013 brings together her most recent paintings which are a set of close-knit oils on masonite that display powerfully inspiring aesthetic affinities. Litherland’s pictures are intrinsically inter-artistic insofar as they constitute visual narratives where texts are present in the images, either as pretexts or as composite integrated components of the visual surface. Let us start with the picture that gives its name to the show, The Reason for the Unreason (Don Quixote) (2012), a portrait of Cervantes’ character sitting in his studio in trance; an open book resting on his lap. Don Quixote’s literary-driven madness, his monomaniacal belief in fiction as a replacement for reality, is depicted by a swirl of hand- painted words that emanates from the book he is holding, invading the whole scene. The sentence, repeatedly hand-painted in Spanish, “la razón de la sinrazón que a mi razón se hace, de tal manera mi razón enflaquece, que con razón me quejo de la vuestra fermosura”/ “The reason for the unreason with which you treat my reason, so weakens my reason that with reason I complain of your beauty”, comes from the first chapter of the novel and Don Quixote credits it to Feliciano Silva, a writer he ironically admires because of the clarity of his prose. Litherland conveys this irony by making it clear that it is love of fiction which entangles and entraps Don Quixote. On the one hand, the entropic swirl of words in abyss, like a mise en scène of linguistic illogical logic, is symbolically matched by the ivy that is climbing around the Knight of the Sad Countenance’s body, slowly capturing him. On the other hand, the materiality of the words inscribed in the picture increases the dialogue between words and images that is implicit in the theme of the oil painting and which is a constant in Litherland’s creations which often display quotes on their surface. I find this complex, meta-artistic interplay between literature and painting representative of Litherland’s pictorial stance in so much as her art is about art. Her pictures are either meta-pictures or intermedial works that lead to stories or songs, just like the words in this painting lead to more words; those present in the painted book.. In this vein, Litherland’s painting methods are already representative of her will to reveal the past and to recreate experiences by means of image-making. She has declared that she uses painting techniques similar to fifteenth century Sienese painters and her interest in the work of Renaissance painters like Giovanni di Paolo, Pieter Brueghel and Lucas Cranach the Elder is evident in the iconography of her human characters as well as in her chromatic elections. Continuing the line of inter-artistic cross-references, Don Juan in the Underworld (2012) is a pictorial recreation of Charles Baudelaire’s poem Don Juan aux enfers (1857). Litherland builds here a Boschesque picturing of Hell, in which tiny therianthropic creatures and a two- headed monster can be perceived swimming in the river Hades. Furthermore, she gives the story an anachronistic twist by having Charon as a tattooed middle-aged man wearing a t-shirt and jeans, whilst sharing the scene with a nineteenth century Don Juan in all his gentleman’s finery; a supplicant and mourning Elvira who still believes in her love for her condemned lover; the statue of Donna Anna’s father half sinking in the waters and two naked girls à la Lucas Cranach who seductively strive for the Casanova’s gaze. The character of Don Juan and his myth is of special interest because it constitutes one of the leitmotifs in Litherland’s mythological oeuvre. In 2008 she painted and exhibited Don Juan in the Wilderness which alternatively shows the charming and romantic side of the hero, who is depicted courting a naked lady in a wild woodland surrounded by alluring and chimeric animals and couples of a different nature making love. There is yet another variation on the topic, Don Juan in Hell (2009), a small oil on masonite this time working on José Zorrilla’s play of Don Juan Tenorio (1844), and depicting Don Juan and the Devil as puppets. However, by means of dialoguing with Baudelaire’s poem which is informed by the French fin de siècle aesthetic ideals of beauty found in ugliness, corruption and Spleen, Litherland intervenes in her previous renditions of the hero. This time, Don Juan confronts Hell calmly (his gaze facing down, incommunicative yet remaining somehow attractive to the others), arrogantly, haughtily even. It is his corruption that triumphs in this pictorial version of the story, he is not a puppet of Hell anymore, but its master and he seems content to be there. Hell is a favored topographic space of Litherland’s iconography and another of her pictures, The Floppy Boot Stomp (for Don Van Vliet) (2012), deals with the encounter between a farmer and the Devil in a cornfield. The Floppy Boot Stomp is inspired by a folk-rock song by Captain Beefheart (Don Van Vliet) and depicts the apparition of Hell on Earth in a rural topography dominated by a yellow and reddish chromatic. The image suggests the classical battle between good and evil in which the farmer manages to overpower the Devil by performing a hoodoo hoedown dance within a crop circle. The picture presents the Devil as a split, cubist two-figured creature: the upside-down female fiddler with a red violin and the chalk white goat with a human face. The over-sized blazing boot, which is the visual focus of the scene, represents the portal between the worlds. Unlike the song, the picture is quite whimsical, the gesture of the farmer—although frightened—is almost comical and the poses and reactions of the animals contribute to this supernatural atmosphere. Little Red Cap (2011) and Wolf Alice (2011) are two images related to the lineage of love affairs between girl and wolf that runs from Paul Delarue’s to the brothers Grimm’s and Charles Perrault’s folk and fairy stories. In visual terms, Little Red Cap is reminiscent of one of Gustave Doré’s etchings for Perrault’s version of the text. Like the French artist, Litherland depicts a meeting and an exchange of gazes between a brave girl and a charming beast who is eager to engage in conversation. Despite the fact that this wolf is enormous and that it is showing its menacing pointy teeth, and in spite of the threatening pack of wolves that can be distinguished in the foggy background, Litherland’s educated girl (do not miss the books and paint brushes in her basket) engages visually with the wolf, she connects to the animal aided by her conviction that she is not a defenseless and helpless creature, but that she can meet the wolf as an equal; she might even play tricks on him. In Litherland’s lupine corpus, women are not commodified as sexual objects dominated by the violent intentions of male beasts, but are offered as empowered and desirous subjects instead. In this vein, even when it clearly evokes the title of the Grimms’s tale, the picture is in direct affinity with Angela Carter’s trilogy of lupine texts from 1979: “The Company of Wolves”, “Wolf-Alice” and “The Werewolf”. Litherland affirms: “Little Red Cap was directly influenced by the line at the end of Company of Wolves [short-story], ‘sweet and sound she sleeps in granny’s bed, between the paws of the tender wolf.” Additionally, Litherland’s Wolf-Alice (for Angela Carter) is explicitly dedicated to the English fairy tale writer as a way to pay tribute to her and to recognize the many connective lines that bring them together. The painting offers an alternative version of Carter’s story, in which a human girl is brought up by wolves and then transforms into a wolf, and works on the sexual appeal of lesbian confidence. A hybrid she-werewolf seems to whisper a secret message to a girl, but who represents Wolf-Alice, the hybrid or the girl whose face is hidden? Litherland is explicitly ambiguous about the identity of her characters and this highlights the notion that the becoming-animal (Deleuze-Guattari) of the girl protagonist of contemporary visual and textual revisions of the classic tale of “Little Red Riding Hood” is not a question of imitating the shape of the animal, that is, wolfishness is not only a matter of physicality or a shape- shifting process, but an intersection with the identity of the wolf on a deep ontological level. Additionally, in 1998 Litherland painted What Path Are You Taking, the Path of Needles or the Path of Pins?, a picture strongly intertwined with Carter’s proposals (both by the reaffirmation of the becoming-animal of the girl and by her portrayal of the iconic female werewolf) and also to Paul Delarue’s folkloric version of the tale from 1885, “Conte de la mère grand”. “Little Red Cap was directly influenced by the line at the end of ‘Company of Wolves’ [short story], ‘sweet and sound she sleeps in granny’s bed, between the paws of the tender wolf.” to pay tribute to her and to recognize the many connective lines that bring them together. Lupercalia (2012), expands these lupine affairs a bit further. On this occasion, the picture concerns the celebration of the Roman pastoral festivals held in February every year honoring the god of shepherds, Lupercus. On this board we can only perceive half of the wolf’s body, his moving tail, as the animal is running out of the picture. Nonetheless, the painting gives us access to another aspect of the Roman myth and the history of the celebration of this festivity. In “The Life of Romulus” Plutarch explains that during Lupercalia the noble youths and high-rank citizens of Rome dressed in goatskins and offered goats and a dog in sacrifice to the god. After immolating the animals and after having cut the goat’s skin into thongs they used parts of them as whips. The women and children of the city came specially to be lashed on their hands as it was considered to be an omen of purification, fertility and good luck. Litherland’s enigmatic painting incorporates the presence of a goat, and a woman and a child (much recalling the girl in Little Red Cap) both with their palms upturned, as if waiting to receive their lucky whip. But the image is disturbing and complex as one can look at the whole scene as being part of the dream- landscape of the out-of-place sleeping figure which contributes to the postmodern aspect of the picture. In Bloom (2012) is representative of Litherland’s Pantheistic and holistic cross-fertilization of humanity and nature that the artist pursues in all her work and which is clearly detailed in her published essay, "Imagination and Wilderness" (1998). This oil painting, in which a hybrid girl-tree is portrayed (eyelids made of petals, hair made of branches and crowned by nest, eggs and bird) suggests that we are all one living organism, one singular expression of interconnections. In the four panels that constitute Four Seasons (2005-2006), Litherland had developed her own appropriation of Giuseppe Arcimboldo’s imagery by creating a set of symbolic and suggestive Winter, Autumn, Spring and Summer in consonance with the Italian portraits, but where her personal signature was decisive: instead of male portraits of the seasons, Litherland’s are female. In Bloom is dedicated to Marosa di Giorgio, an Arcimboldesque Uruguayan poet in her own right, who produced many writings on metamorphosis from women into plants. With this portrait Litherland participates in Arcimboldo’s and di Giorgio’s collage disposition of natural elements and with their latent symbolism, whilst she continues developing her personal rendition of the topic of symbiotic relations. Not surprisingly, a peeping wolf, in camouflage, makes its appearance one more time on the right hand side of the picture. Surrealism, Magical Realism, Romanticism, Symbolism, alchemic Mannerism and conceited Baroque, all these tags can apply to describe, or to picture, Litherland’s art which relies on the defamiliarization of perception and on opening up artistic expression to untamed forces of creation. “Make It New”, that was the US poet Ezra Pound’s famous artistic motto and avant-gardist exhortation. 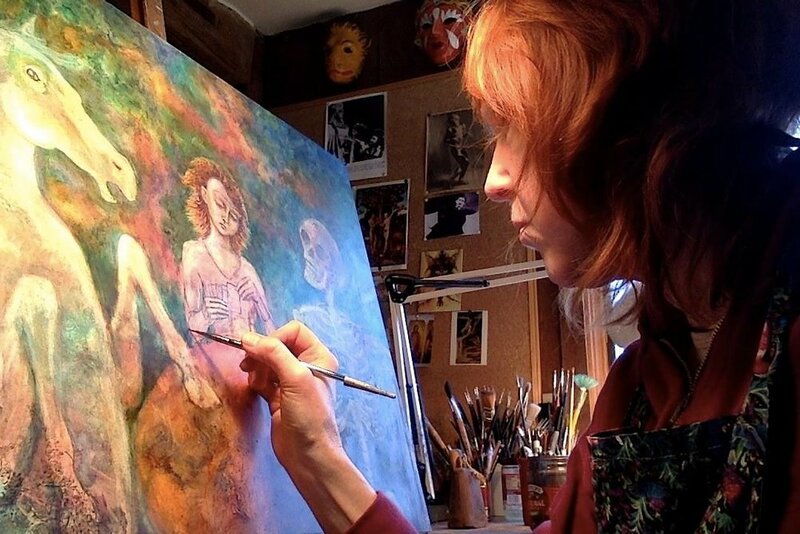 In the twenty-first century, Gina Litherland shows, with outstanding craftsmanship and exquisite taste, that innovation comes from renovation, that the history of art is part of contemporary art and that originality depends on ruptures as much as it is built on connections.